We had siomai last Tuesday and I saw this afternoon that there were lots of wonton wrapper left in the fridge. Well, I saw two opened wonton wrapper pack, one was I think couple of weeks ago (that went straight to the bin) and the other one was the pack used this week. Buying ingredients and leaving it in the fridge until roots grow on it is so waste of money and fridge space. Better make good use of this ingredients. Luckily, we have our sari-sari store (a small home-based retail store common in the Philippines), I grabbed a couple of canned tuna and tomatoes. I just remembered I bought a small tub of sour cream and grabbed it from the fridge. I checked my spice supplies, cumin and allspice present. 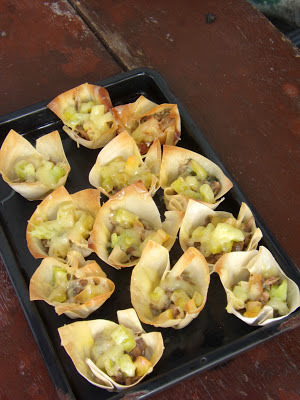 This calls for tuna taco cups or wonton cups (since I’m using wonton wrapper). 1. 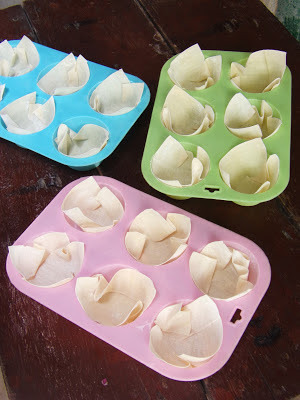 Arrange wanton wrapper in a muffin pan. Spray some oil and bake until slightly golden brown. 2. Heat oil. Saute onions and parsley. Add the canned tuna. Season with salt and pepper (about a pinch). Continue cooking until there is no liquid to it. Set aside. 3. Scoop some tuna fillings and chopped tomatoes. Topped with grated cheese and bake until cheese melts. 4. Topped with sour cream and hot sauce if desired. When I sunk my teeth on the tuna taco cups, you could hear the crunchiness of the wonton wrapper followed by the bursting of different flavors of this dish. I love how the cumin overpowered the fishy taste and smell of canned tuna. The smell of the tuna filling is that of real meat filling for nachos. The chopped tomatoes added some crunch and refreshing flavor to the dish. The sour cream helps to lighten up the tuna tac cups from the flavor of the spices.